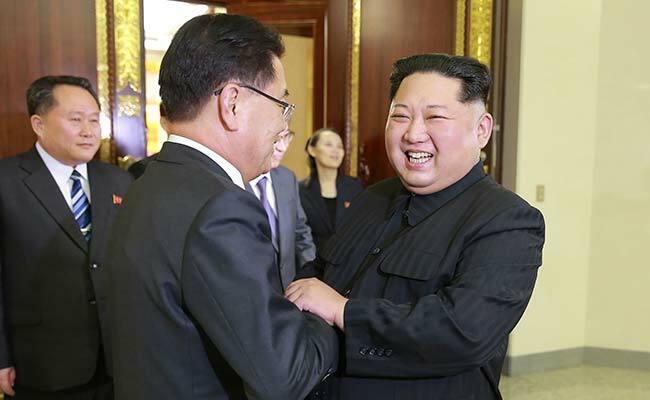 The foreign ministry issued a statement late Tuesday praising the "positive outcomes" of a meeting between South Korean envoys and North Korean leader Kim Jong Un in Pyongyang. Beijing, China: China has cautiously welcomed an agreement by North and South Korea to hold a historic summit, urging both sides to "seize the current opportunity" to promote the denuclearisation of the peninsula. "We hope that the DPRK and the ROK can earnestly implement the relevant consensus and continue with their efforts to advance reconciliation and cooperation," Chinese foreign ministry spokesman Geng Shuang said in the statement, using the acronyms of the North and South. "We hope that all relevant parties can seize the current opportunity, work for the shared goal and make concerted efforts to promote the process of denuclearisation of the Peninsula and politically resolving the Korean Peninsula issue," Geng said. "China is willing to continue to play its due role to this end." Earlier on Tuesday, before the landmark announcement, Geng had told reporters that "interactions" between North and South Korea "should be expanded" to include the United States. US President Donald Trump welcomed Pyongyang's offer as positive and apparently sincere crediting Washington's "very, very strong" sanctions push, as well as "big help" from China, for the potential diplomatic breakthrough. Calling the statements coming out of both Seoul and Pyongyang "very positive," Trump refused to rule out a historic meeting with Kim. "We have come a long way at least rhetorically with North Korea," Trump said. "It would be a great thing for the world, it would be a great thing for North Korea, it would be a great thing for the peninsula, but we will see what happens," he said in the Oval Office. "We are going to do something, one way or the other, we are going to do something and not let that situation fester," Trump said, in a reference to the standoff over Pyongyang's nuclear ambitions.